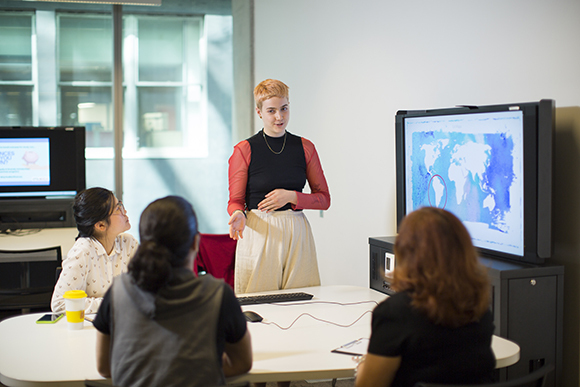 Designed to support both informal and formal learning, UTS spaces are inspired by UTS's learning.futures strategy and provide students and staff with dynamic physical spaces to collaborate and interact. Take a look at just some of the innovative learning spaces for students. And of course, you are welcome to wander through the campus and witness the vibrant learning spaces in-action. New collaborative theatres facilitate multiple forms of engagement including lecture presentations, collaborative group work and technology-enabled activities. Many spaces can facilitate larger classes and then be switched to enable smaller group work. These spaces are open for students to use any-time of the day and provide opportunities for technology-enabled project group work. Situated in Learning Commons and are primarily for informal learning. These spaces can also be booked by academics for occasional use to explore different teaching and learning approaches. These spaces lend themselves to learning and research events involving the wider community. Support students in their activities throughout the day. Found throughout the campus, these spaces are the perfect spot for quiet study, team meet-ups or simply a place to hang between classes. 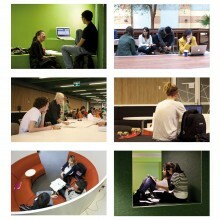 I think the spaces at UTS bring a very comfortable and versatile aspect to uni for students. There are lots of different buildings on different levels and lots of different facilities. I think its great because there are lots of pod areas where there are computers and big tables and chairs so you can do group work and you can see your work on the screen which is really great and also there are cafes around so you can have a very social study aspect as well. © Copyright UTS - CRICOS Provider No: 00099F - 02 April 2019 12:39 PM. The page is authorised by Deputy Vice-Chancellor and Vice-President (Corporate Services).